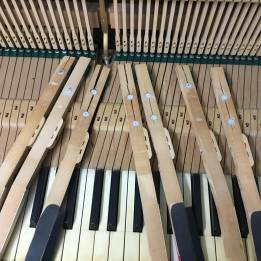 This piano restoration blog has information about how Piano Magic replaces problem key leads. Leads weights have been used in piano keys since the first pianos. The piano key needs to return after being played and the lead weights help to return the keys to the standing position. Normally the key leads are placed in the middle of the wooden key toward the end. Confusing isn’t it. Well have a look at this video and you will understand more. The problem with lead in the piano Key is that the piano lasts too long. When the piano is about 60 to 100 years old the lead corrodes and starts swelling. This bulges the key making the keys un-level and then they swell sideways. This causes the keys to rub together and stick. Badly corroded leads can cripple the playability of a piano. This video is about a model that has tried to hide the lead inside the key. So we had to strip the key to extract the old lead and then we replaced the lead the traditional way. And as you can see the piano played fine at the end. So have a look at this video. As as we do more leading jobs I will put more info into this blog so come back and check in from time to time. I you have a piano that you think might need key leads then give me a call at Piano Magic 08 94775866.